When Lumines was originally released for the PSP way back in 2004 it was a game I played obsessively. The visuals, music, and feedback generated from the rhythms and sounds were so satisfying and visceral. Fast forward 14 years and Lumines is being released in a remastered version with the blessing of creator Tetsuya Mizuguchi. The gimmicky aspects of Trance mode aside, Lumines Remastered is still the amazing game that alternates between zen-like focus and crazy panic as the blocks speed up. The point of the game is to drop four-part square blocks made up in various patterns onto the game field. As in other matching games, colors have to align to be removed, and in this game sequences of four or more are required to clear the blocks. Despite the impressive lineage of the game and its creator, Lumines Remastered is a pretty vanilla remake of the original, blending components from Lumines I and II into one package. The big addition is enabling haptic feedback from Joy-con controllers on the switch or additionally attached controllers on the PC4 or Xbox One. Mizuguchi has always been interested in generating physical feedback from his rhythm games, dating back to Rez, and this inclusion is odd but interesting if only for a little while. For the Nintendo Switch version, up to eight Joy-cons (who has that many?) can be activated as well. Eight Xbox One controllers can be activated for that version. The PS4 lags behind, allowing only a paltry four controllers to be synced to the game. Once controllers are present and activated, drape them – well – wherever you want on your body, and activate Trance vibration to feel the bass all across your various chosen body parts. Nothing weird could possibly come of this. 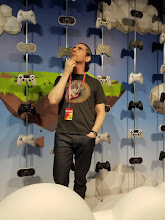 I tried the Trance mode at PAX East with an available Joy-Con belt and the feel of the bass on my hips was really intense and a little unnerving at times. At home I placed an extra PS4 controller on and under my thigh and foot (as per developer recommendations) and it did generate some interesting rumbles that I have to admit were interesting and even therapeutic (for the feet especially). Afterwards I realized I had my foot on a controller, and felt bad for whomever would play with it next. As the patterns are changing, careful planning of the landing spots is required, and as scores add up, the skin changes, which also effects the colors of the blocks and the music. This shift requires mental realignment and adds tactics and thought needed to play the field just right. There are a number of game modes, such as Challenge, Skin Edit, and Time Attack, but the interesting ones that shake up the formula are Puzzle and Mission. In Puzzle I was challenged to make a shape out of blocks in a set time frame. Mission was a Lumines IIfeature where a directive is given that has to be completed in a set time frame as well. The basic gameplay is the same, but at least in these modes a more complex task is required, which makes the game more frantic. The music in Lumines Remastered is probably more important than the visuals, with EDM-style tracks playing in sync with the visuals on screen. When blocks land and matches disappear, tones and beats enhance the experience. The addition of haptic feedback is obviously something Mizuguchi has always wanted, as the screen pulses with feedback that you know he wanted to be physical. Some of the audio tracks transported me back in time, as I remember the songs from the first games back on the PSP. In this version however the music is sampled at a much higher bitrate. While I had no way to compare them (my PSP is buried somewhere in a lost junk drawer) I can certainly tell the music is crisp and clear with a pleasingly sharp clarity. In the end Lumines Remastered is a terrific cosmetic re-do of a phenomenal games series, but that is basically all. Adding the haptic feedback options was a nice touch but it is a gimmick few will consistently use. The game was designed to be mobile and despite its being terrifically fun to play at my PS4 I miss being able to take it with me to the couch or park. The switch version would be the perfect middle ground for this game as it can be portable and stationary. On the fixed consoles however it is a fun if fleeting experience.